A YouTube download button can help you to download videos from YouTube in 1 click, which is quite easy for users to enjoy YouTube videos for offline. Here we will show you the best YouTube download button helper and detailed guide on how to add download button to YouTube to download the videos easily. You might search from the Internet and find many kinds of extensions for your browser to download videos from YouTube. In this article, I would like to recommend the outstanding iTube Studio YouTube Downloader version is also available). 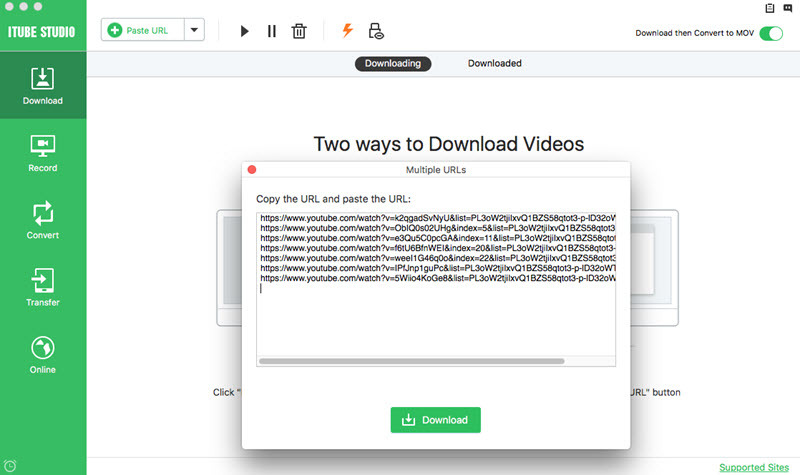 This smart YouTube download extension can detect the YouTube video you are playing in Safari, Chrome or Firefox, and automatically add a YouTube download button to the video page, so that you can capture the video from YouTube in only one click for free. Download videos with Download button option from more than 10,000 video sites inclucidng YouTube, Facebook, Instagram, Vimeo, Hulu and more. Support to download 4K & Full HD videos, and it can download the whole YouTube playlist, channel, category and Lynda playlist. Come with a built-in FLV media player that allows you to play the downloaded YouTube video as well as your desktop videos. 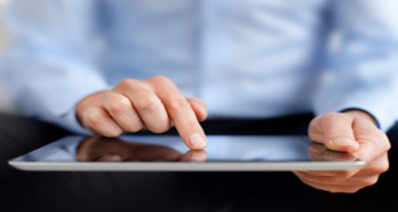 Record any online video from any online video site even those "unable to download" ones. Support downloading of cloud storage backup such as Dropbox, Google Drive, One Drive, Box.com, etc. Private Mode to keep your video downloading under protection by a password known by yourself only. 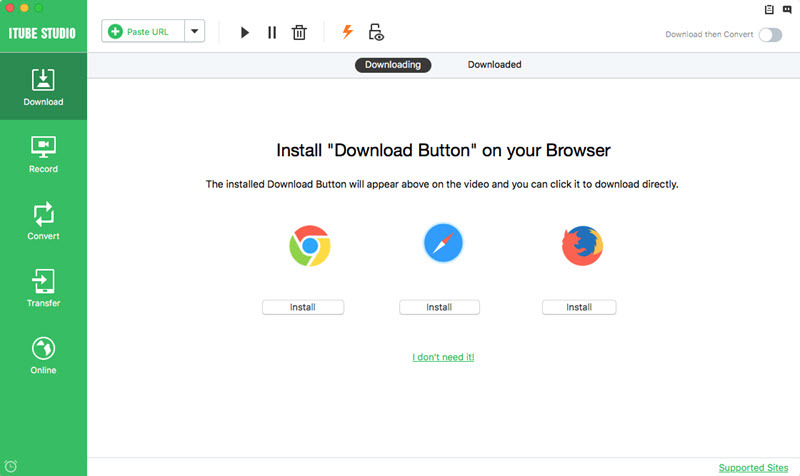 Click above "Free Download" button to download the application, and you will get an installation wizard that supports you to finish installing it. When you're done, the program will run in background, and the add-ons for downloading video will be installed in your browser automatically. If you haven't found the Download button on YouTube page, please click here to find more help on how to install download extension to browser Safari, Chrome, or Firefox. Now, open Safari, Chrome or Firefox and input YouTube.com, you will see a "Download" button on YouTube video page. Directly click on the button, the program will load the file and start downloading immediately. This powerful YouTube Download option provider also provides two more options for you to download YouTube videos. You can go to the address bar of the browser and drag the video URL to the program for downloading. Alternatively, you can copy the video URL and click the "Paste URL" button to add the video to the download queue. When the application is working in progress, you can let it work in background and continue to enjoy other wonderful videos on YouTube. 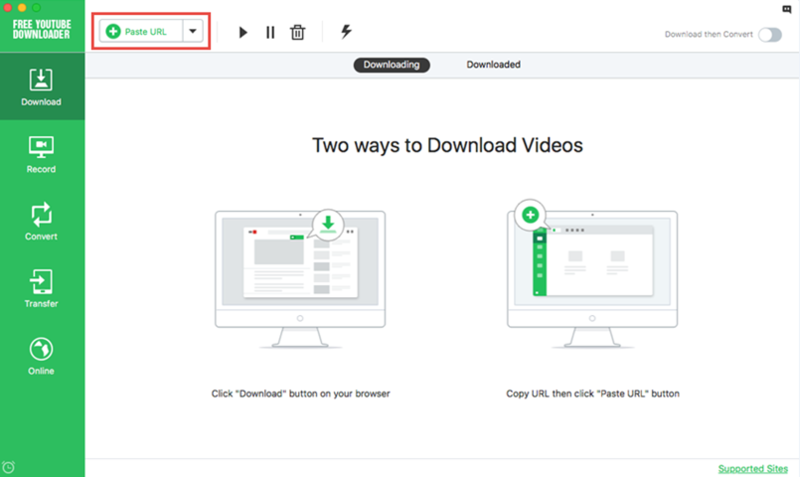 If you want to add new video to download queue, you can click the download button on the new video page for downloading. 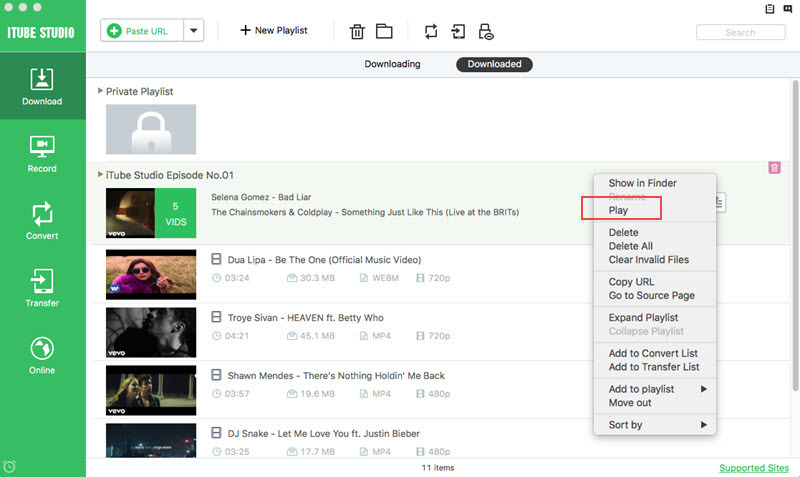 All the downloaded video will be saved in the "Downloaded" tab which is in the "Download" menu. Double click the video thumbnail to play this video with the built-in player. Or you can right click the video to select the "Play" option. You also can import your desktop videos to this application for management. To do so, you can go to "Transfer" menu and click the "Add" icon on the top of this window, then select the videos you need to import them to the program from the pop-up window. Then you can organize them by date or by name. You also can right click one of the videos to select "Play" option to play it. Downloading random junk or a destructive virus to your device does happen with many YouTube download button add-ons especially when they are from external sources. Even though some browsers provide video download add-ons, and they try to protect the user from harmful ones, they may be ineffective and it may impossible to avoid using those from external sources. It's therefore risky and often requires a ton of research to find safe, secure, and trustworthy add-ons. There are many YouTube video download add-ons and any changes within the browser, usually updates, lead to incompatibility between the browser and the add-on. This may require the user to change the add-on. Similarly, changes with other extensions may create a conflict between the add-on and other those extensions, which may cause the add-on to stop working. Sometimes the add-on gets discontinued and can no longer be used due to these changes. All this frustrates the user who has to keep seeking new solutions for YouTube download button add-ons. The purpose of downloading videos is to watch them while offline; however, sometimes the video downloads in a format that needs to be converted into an .mp4 or .mov file. Whereas some add-ons offer a conversion process, others do not and those that do may have it as too technical and complicated a process for the layman. TubeYouTube is constantly changing its source code, whereas many add-ons don't, which means they may stop working suddenly. This gives them a short shelf-life. As a user, you have to keep searching for other safe, compatible, and reliable add-ons without conversion issues, which can be very frustrating. Some add-ons detect a video playing in the browser and offer a one-click download button in a specific part of the screen. Other add-ons require a few clicks to get to the download button and the sequence of those clicks differ from one add-on to another. So, whereas they all achieve the same result, these different steps create different user experiences. This compounded with the other issues make these differences in functionality problematic. These issues collectively make finding reliable YouTube download button add-ons to use for long periods of time difficult and sometimes even impossible.